Quiltville's Quips & Snips!! : Flowers, Shout Outs, Quilts & Chairs! Dear Aunt Pat Dobson in NZ! You are not my aunt, but you sure have family over here in the states that love you! I have heard that you have some nephews and nieces in Oregon that love and adore the exceptional quilts that you have created for them. I am not a quilter, but I am a quilting fan due to the spectacular works of art that my Aunt Pat has sent my family here in Corvallis, OR over the years. The latest gifts were 3 outstanding bed quilts for our 3 children..... Which will be forever cherished. Pat, is a human being with considerable character and passion who has a wonderment for life. She also speaks highly of you, your talent and the delight with which she inhales your blog. She is not alone, as she has a quilting village in and around Te Anau, NZ who are also avid fans of yours and hers. As a result I am wondering if there is any possibility that you could incorporate a brief message to her via your blog? My brief message to Pat is to keep on sewing up the scraps! She already knows what she is doing, and it sounds like she's given some beautiful quilts. When the going gets tough, the tough get quilting. I'm wishing you many happy finishes, Pat! Love of family makes the world go round, no matter how far apart we are from each other. I wanted to share with you the quilt our little Facebook group made. One of our group is on the active list for a Heart-Lung transplant. We wanted to make her a quilt for her to take into hospital with her and for her recovery. We have all abilities of quilters in our group, so we chose Carolina Chain from your blog posts. We decided to do it in blue and white but 2 of the group wanted to applique hearts for it to show that the quilt was made with love for her. Of course she cried and loves it. Awesome! Quilts give love, and quilts are received with so much love! And then this one takes the CAKE --- or would that be the SEAT!? Thought you might like to see the quilted slipcover I made using the Grand Illusion blocks. The cushions are reversible. Thanks for the mystery quilt. It's the 2nd one I've done and I really enjoy it. With cushions reversed! SO COOL! Kris, I just LOVE this! How fun this would be to have in the studio! This is really terrific! Thank you for sharing your photos and stories with me. I love to be part of them. I feel like we have developed this wonderful community of sharing and giving and learning and laughing and – well, putting up with my endless travel and all that goes with it! You guys are the balance to my craziness! And speaking of crazy—I've been up since 4:20 this morning. It seems I have had a reaction to the facial and massage that I had yesterday and my face is red hot and itchy, and even my arms where they massaged my arms during the facial are not reacting well to whatever lotion they used. I’ve never had this happen before. It’s almost like hives…I’ve showered again, and lotioned up with some stuff I KNOW is more calming to my skin. Scrappy Reds for a certain Christmas Quilt! There will likely be a nap before I head over for my presentation in Greensboro tonight. And if I get this binding on, maybe I’ll just settle into my recliner and bind the day away. Oh – and I almost forgot! So many link-ups have come in for our Grand Illusion Progress Party! Click HERE to see them all and check what you may have missed! Entries will be accepted until Sunday evening at 11:55pm EST. I'd take an antihistamine, the kind you'd take for hay fever. Feel better. Was there any rose water in the lotion? My sister and I, independently, many years ago had a similar reaction to a skin product we had both used successfully for years. When we both ( again independently) investigated we discovered the product had been enhanced and now contained rose water which we were both allergic to. Piriton , an antihistamine, should help. Bonnie... I can't use Liquid bath soap! Due to one ingredient, I found this from misery ... and a good friend knew which ingredient, because it does the same to her. As an retired Hairdresser, I believe ALL, everyone of them, products used on or in a person's body should go through a government testing...and it be made known MANY MANY chemicals will do terrible things to you. Hoping you feel better. My Derm Doc have me a medical cream to use all over, and told me to take a 'good over the counter 'antihistamine. It worked. A few weeks ago, someone posted the name of a plastic quilting guide that goes onto your machine with two screws. It was a ladies name, and she is in the US. Can you re-post that info in the comments below for me? I forgot to write it down and can't remember now. Thank you so much. Love, love, love the chair !!! Thank you creative lady, for sharing. So sorry, Bonnie, that you've had a bad reaction to a wonderful spa treat. Run hot water (as hot as you can stand) over the area followed by as cold of water as you can stand; what happens is, what I was told anyway, the histamine rushes to the area and you get intense itching for several seconds and once that subsides switch to the cold water. The itching is almost always alleviated for several hours. I don't even do the cold water anymore and I have successfully done hot damp washcloth compresses over itchy areas when running water over it wasn't an option. My daughter has all sorts of allergies and reacts to many different foods, exposure to various cosmetics.... antihistamine will help, but better to try a cortisone type cream... won't make you sleepy, works where you need it. Ask pharmacist for a cream for allergic reactions, since various brands have different names, ingredients. What a wonderful letter to show appreciation of a quilter in New Zealand. Also, I LOVE the slipcovered chair. REALLY LOVE IT!!! Take care of yourself, Bonnie, and take an antihistamine. Hope the shower got rid of all the itching Bonnie! 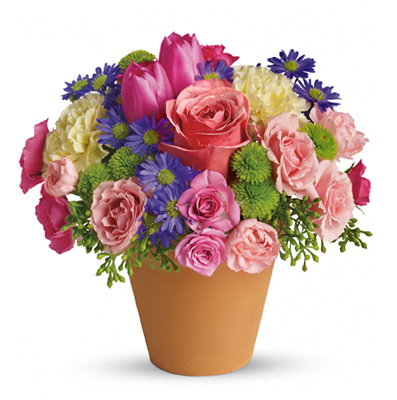 "Aunt Pat" and her quilting friends are going to get a real kick out of your flowers! Love the Grand Illision Chair! nice job Kris!